Roadside Chronicles: Life On The Road: Day 10 - October 11, 2017: Hot tubbing in Nevada! Day 10 - October 11, 2017: Hot tubbing in Nevada! Day 10 – Wednesday, October 11, 2017: Packed up for an early departure to work our way to do visit some hot tubs in Nevada while the weather held (not too much below freezing at night)…coming back to Utah after that. I really wanted to soak in some hot springs (without chlorine). Son, Graham, is going to meet us so we zoomed past a few things that we were going to do today to get into Nevada and meet up for a night. 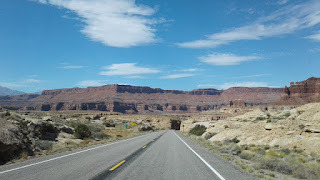 We drove routes 191 from needles section of Canyonlands to route 95 to route 24….all VERY scenic and gas sucking with its ups and downs. This is something we will do again and take our time at it for walking and using the jeep on dirt/gravel roads. We did not make Nevada before dark….which meant we/he had been driving long enough. 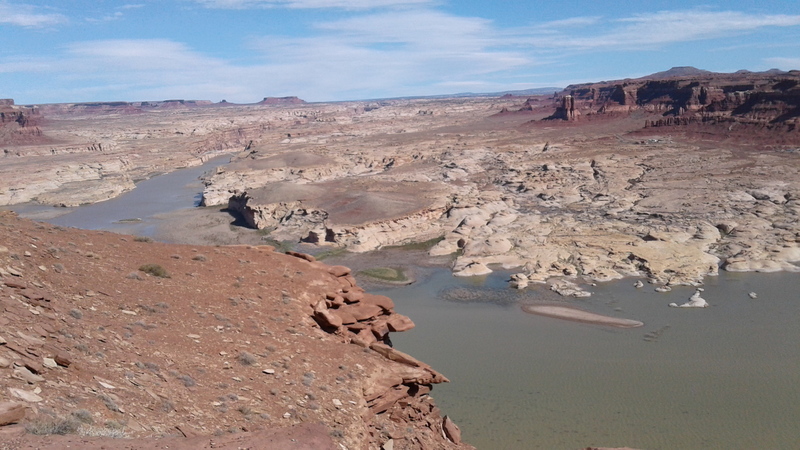 I found Lake Scipio on the map (still in Utah) and a dirt/gravel road by it leading to a trailhead. This is where we will spend the night. Mali dog was getting pretty desparate to get some of her energy out. How do I know this? She turns into Landshark and brings out the jaws to grab stuff that is not hers (shoes mostly, but anything else she can get her jaws on). She is already a mouthy girl but add too much unspent energy and I am ready for the tranquilizer gun (JUST KIDDING). She has a soft mouth but they are still teeth. Upon arrival out came the long line (about 90 feet worth of running for her) and back and forth she ran (for kibble…she works really well for food). About ¼ mile in from the road and it is quiet except for the wind. The dog sleeps! A nice spot for a quick overnight.